The company said new rules threatened its ability to continue. A blue and a black balloon are floating outside at a pro Uber rally in Montreal, April 29, 2016. MONTREAL — The Quebec government is trying to impose a rigid and outdated taxi model on Uber's flexible way of doing business and if nothing changes, the ride-hailing company will disappear from the province's roads by mid-October, the company warned Tuesday. 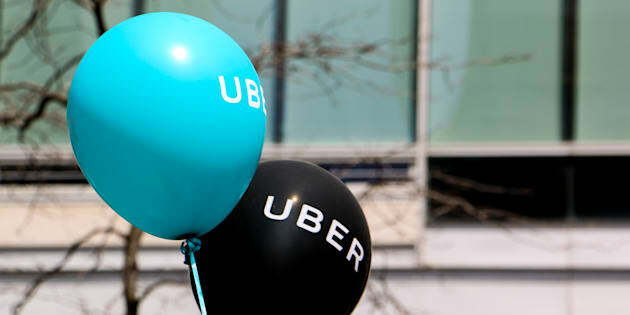 The province already had the most "severe'' rules regulating the company in Canada, Uber's Quebec general manager Jean-Nicolas Guillemette said. Forcing all Uber drivers to undergo a mandatory 35 hours of training, as Transport Minister Laurent Lessard announced last week, will make it impossible for the company to continue its operations in Quebec beyond Oct. 14, Guillemette added. Quebec responded dismissively to Guillemette's announcement. Quebec Transport Minister Laurent Lessard responds to reporters questions before entering a cabinet meeting, Wednesday, April 12, 2017 at the legislature in Quebec City. "I am very surprised that a big company, a big multinational like Uber, can't find a way to use its application to train its drivers,'' Lessard told a news conference in Quebec City. Quebec's decision is the latest public rebuke against the San Francisco-based company, which has faced a series of scandals over the past year involving its corporate culture and respect for local laws. Guillemette told a Montreal news conference the majority of Uber drivers are part-time and often test out the service for a few hours to see if it works for them. Forcing drivers to be trained for 35 hours before they can try the Uber platform destroys the firm's business model, he said. "This is the beauty of the Uber platform — it's the flexibility that the driver-partners have to come and go and decide when they want to drive,'' Guillemette said. Last year, Quebec signed an agreement with Uber on a one-year pilot project allowing the company to operate in the province — despite heavy opposition from the traditional taxi industry. The agreement allowed for a one-year extension; after that, the legislature would have to adopt a new law to permit the company to continue operating. A taxi driver holds a sign reading 'Uber violates laws and tax laws; arrest them' as he and other taxi drivers begin their protest against Uber in Montreal on Oct. 5, 2016. Taxi drivers have been incensed with Uber ever since its entry into the market because, for decades, the government had limited the number of taxi permits in each city in the province. Uber bypassed that regulation and started offering people rides without obtaining a costly permit. Due to lower overhead, they were able to undercut the traditional taxi industry and cabbies argue the value of their permits have diminished significantly as a result. Wilson Jean Paul, spokesman for the main union representing taxi drivers and those who own taxi operating permits, said Uber has done nothing but "blackmail'' the province since it started operating. Paul cited the city of London, England, as an example of another jurisdiction tired of the company's corporate behaviour. Last week, London said it would not be renewing Uber's operating license that expires on Sept. 30, because it was not "fit and proper'' to continue doing business in that city. It cited instances in which Uber failed to report serious criminal offences as well as allegedly deceiving regulators. Uber said it will appeal, during which time it can continue operating. Last week, Lessard said the government would be renewing the agreement for the year, but told Uber it had to abide by mandatory training and background checks conducted by the police as opposed to a private company. Uber wasn't opposed to the background check changes, but Guillemette said the training requirement was not possible. Guillemette said he hopes to come to an agreement with the government or Uber will leave Quebec by Oct. 14. The number of hours worked by an estimated 10,000 Uber drivers in Quebec last year were equivalent to 3,000 full-time jobs in the province, he added. John-Kurt Pliniussen, professor at Queen's University Smith School of Business, said if Quebecers want to keep Uber they'll need to put more pressure on politicians. A man poses holding a smartphone showing the app for ride-sharing cab service Uber in London on Sept. 22, 2017. "In London, England, when they announced Uber would be leaving over 200,000 Uber riders signed a petition,'' said Pliniussen, who conducts research on artificial intelligence and the auto industry. He said Quebec's stance on Uber demonstrates the province has high standards — but he warned in 24 months, the game will change completely. "Twenty-four months and we'll have self-driving cars,'' Pliniussen said. "Uber or its competitor will call up the cars, no one will be in them. We'll get in and it'll take us to work. Uber says it has 5,000 weekly drivers on its platform in Quebec.